But inside all is bright and cheery. 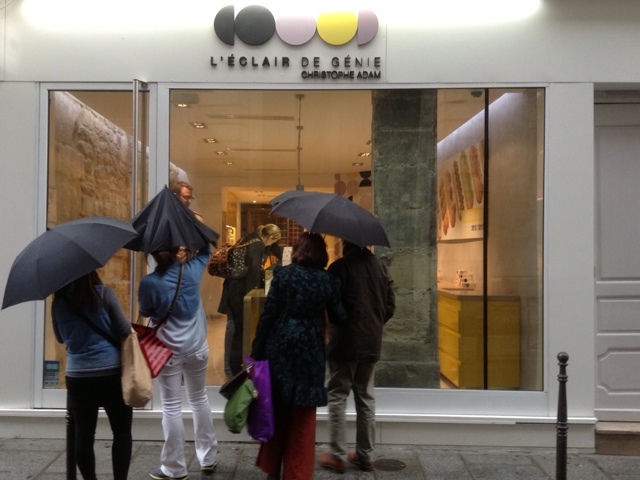 The éclairs are displayed like art objects in an art galerie and so they should be. No kidding. Each one is a work of art. L'eclair caramel beurre salé is the top seller. The buyer in front of me cleaned them out. L'éclair Vanille Noix de pécan is another top seller with caramelized American pecans and vanilla from Madagascar. 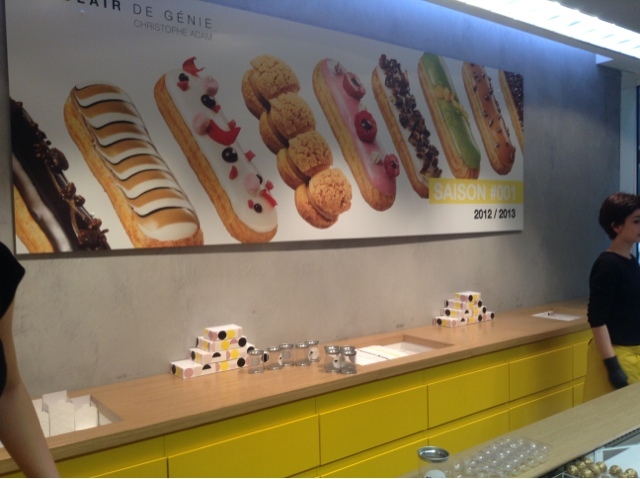 But I fell hard for eclair de Maracuja. With passion fruit and a Brazilian name who could resist? Adding in eclair Rouge Framboise, what better way to beat the bad weather? 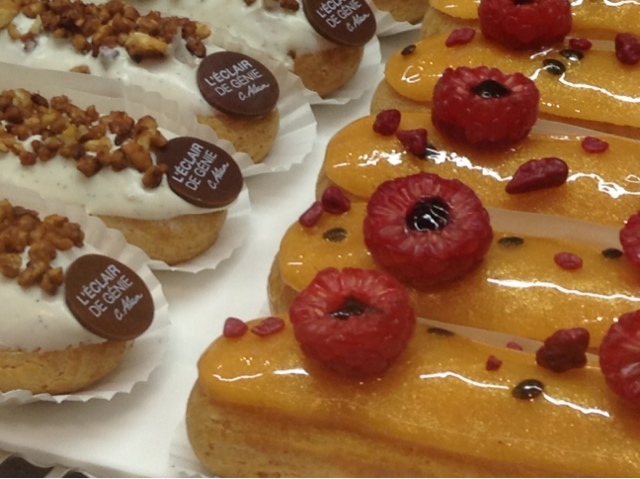 I was surprised to read the eclair was crowned France’s most popular pastry in 2012. Please *note the ovoid arch-shape when you cut into any éclair. All became clear when I boarded bus #69 to head home trying desperately to protect my éclairs from rush hour crowds. 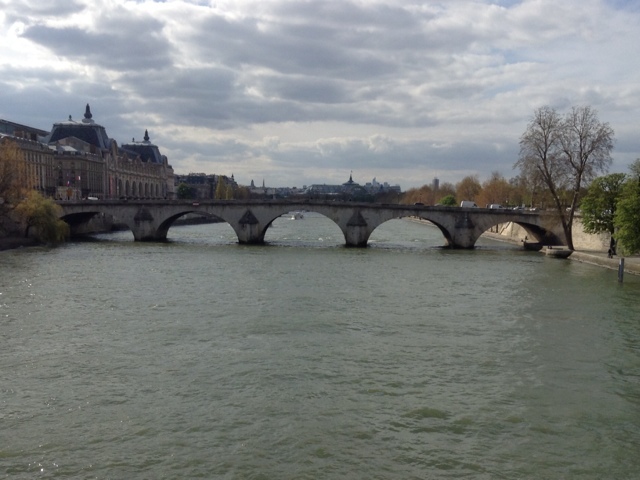 Paris is chock-full of eclair-shaped arches! 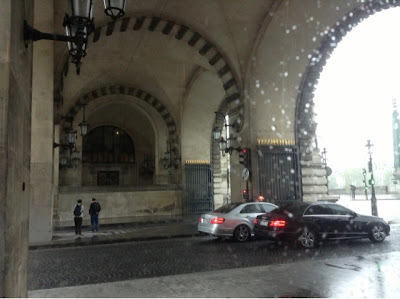 The bus #69 will take you past at least a good 10 éclair-arches. There's no getting around it. Cross any bridge in Paris and how can you not think éclairs? 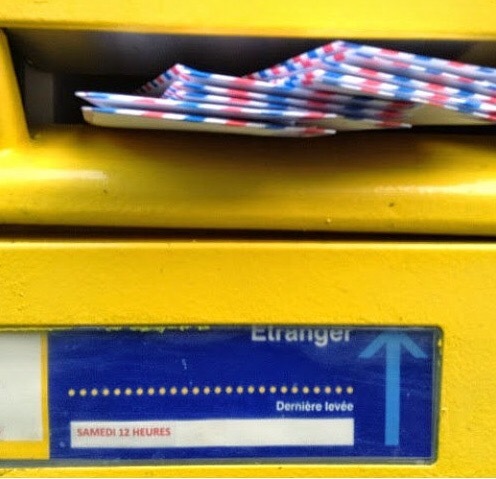 It's a given...a fait á complet! This archway at the Louvre. 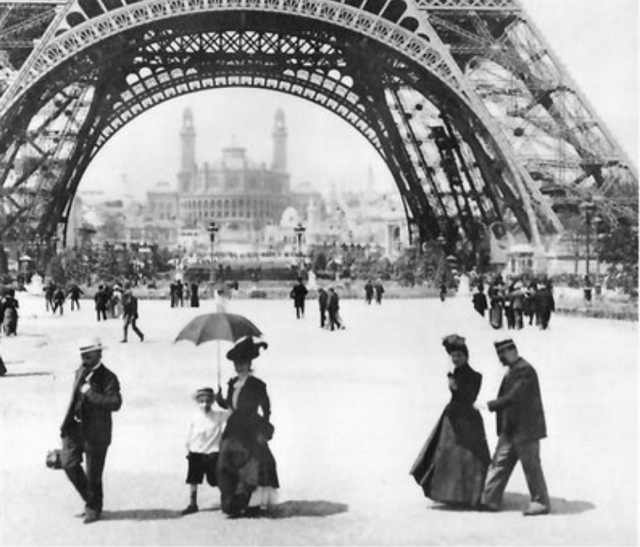 That monster éclair-shaped arch - Paris' beloved Eiffel Tower. But of course the éclair is France's best loved pastry. No question about it! Is there any other choice dear PBers? 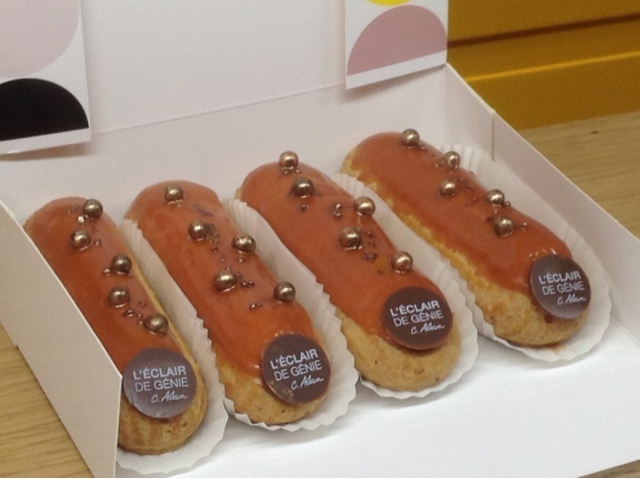 I was delighted to find my éclairs arrived home in perfect condition. And they tasted even better. Even after a couple of airborne somersaults. L'Éclair de Génie are a bit shorter than your average 15 cm éclair. More like 11 - 12 cm of deliousness. I found this a plus. Some éclairs are too much of a good thing. They can be too heavy, too sweet. These were just right. Chef Christophe Adams has been creating les éclairs at Fauchon for 10 years before he opened L'Éclair de Génie, so he should know what it takes to make the perfect éclair. Do try them out PBers. I will now think of you when I look at those arches! 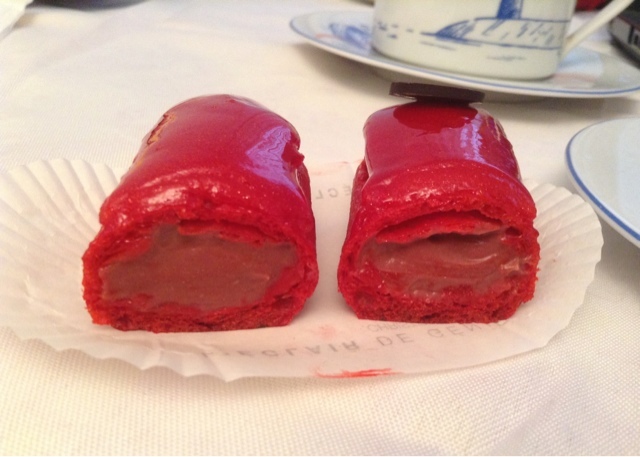 No No think éclairs !! 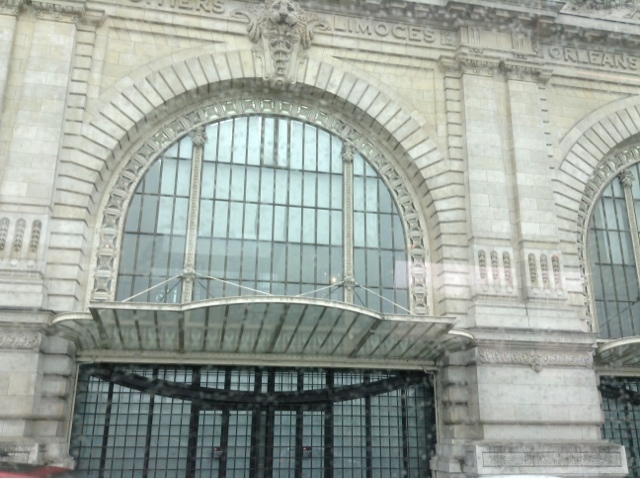 Love the way you do architectural geometrie! I think I would fall hard for the caramel beurre sale!!! I love your life: even a bus ride home in the rain is an event, with precious cargo and Paris everywhere you look and your eyes taking it all in. They all looked so tempting, although I'm a choc o'holic, that caramel beurre sale would have been my choice. It's amazing how the assistant wrapped up your gateaux in such a way they didn't get dammaged even at rush hr on the #69. Love your bus journey. PS It is pretty amazing they arrived home intact. There wasn't even a sticker on the box!? The eclairs must be given special instructions not to turn over or else! 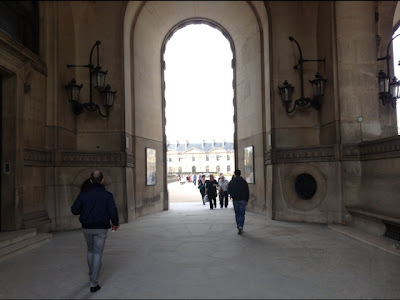 I HAVE TO go Paris for some days to visit (and eat) all the nice places you put on your blog!!!! Love that Maracuja éclair ! 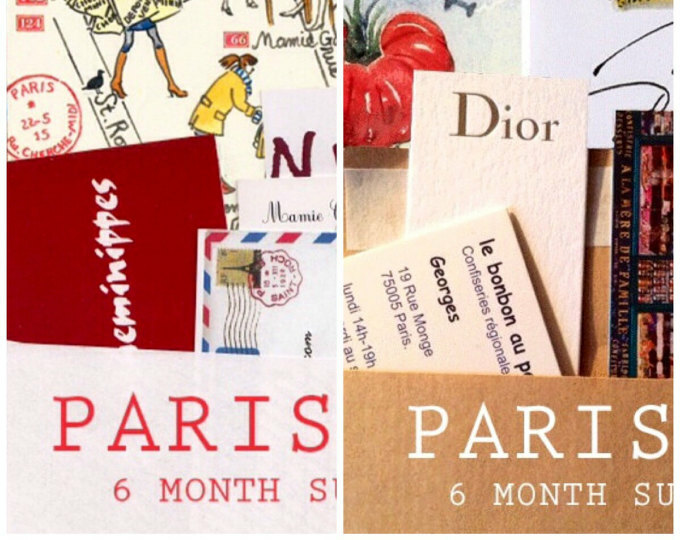 Carol, it is such a joy for us to share in your Parisian feast. The eclairs all look so tempting, and those architectural arches are also rather splendid. Even on a rainy day, that bus route provides such inspiration. I enjoy seeing things through your artist's eye. I would never take it all in as you do. Thanks for another interesting post. I love bus 69 for a fun above ground tour of Paris. 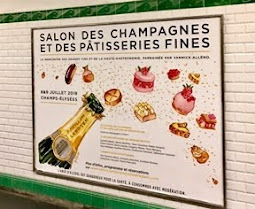 I would have been so disappointed if the whole supply of éclair caramel beurre salé would have sold out moments before I had a chance to get one. The 69 bus offers *the best* ride through Paris. Please stop doing this to us. :o) I love eclairs! And I've only had cheap American ones. 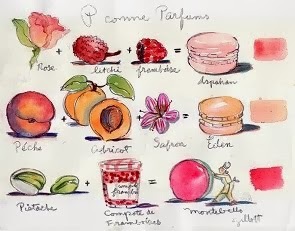 I can't imagine how heavenly those made in Paris must taste. Then forgetaboutit so no shipping over seas! Mon dieu! New tempêtions beckon! Temptation everyday in this town is not easy to handle.. I know why people smoke..hard to smoke and eat pastry! I come here everyday and I am never disappointed. I love your take on life, even a trip home from the bakery. 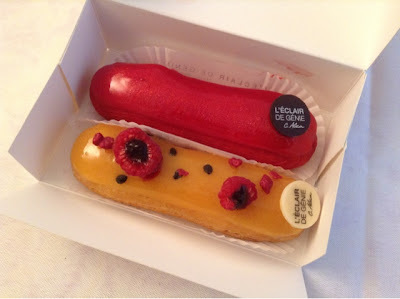 I am amused that I can be amused over an eclair, but I am so craving one now. 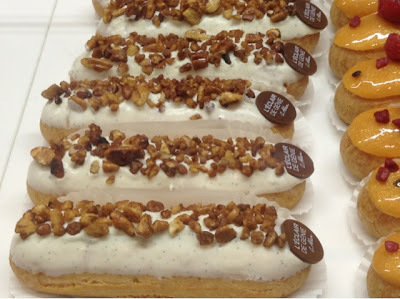 Great photos, Carol; the eclairs look fabulous ( I like the pecan topped ones) and so does Paris! To be honest, I don't even like eclairs,but! But that has changes after these babies! How can it be that I live here in Germany, a place with, well, let's just say, disappointing, pastry, and yet be so close to the source of such sublime pleasure! A political border is much more than just an arbitrary line. Even the "French" bakeries here pale. 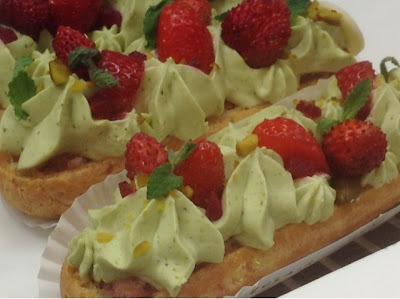 My husband is a great eclair fan, and is planning an eclair challenge for our trip (starting next month! woo hoo), he has made a list of 34 eclairs he plans to try on our trip. 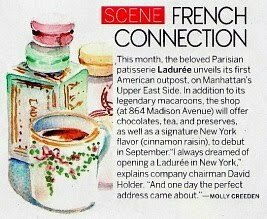 I can't imagine devoting myself to any one particular pastry- there are too many gorgeous things to try- but am looking forward to some. The Rouge Framboise from Eclair de Genie being a particular object of desire. How gorgeous is that? I hope it tasted as good as it looks. Once again I'm amazed by your eye- I love your eclair/arch connections. Were they happy for you taking photos? 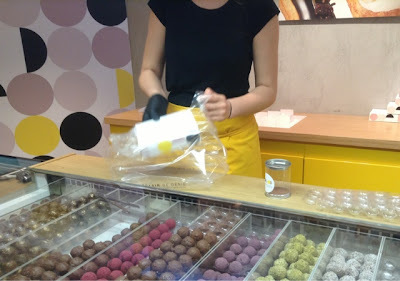 And are they cupcakes under the counter where the vendeuse is bagging your purchases? And no cupcakes on the premises at all. What are those balls of colour under the counter then? Intriguing. I didn't think they'd be cupcakes but can't quite make out what they are. Another very good adresse you mention in PB! I fully agree with your taste Carol !